Get Personalized Hand Fans for Successful Summer Events! One of the most popular summer giveaways is undoubtedly the humble but mighty paper or card stock fans. Our basswood handle personalized hand fans are certainly one of the most inquired and requested summer items. In the sweltering summer heat, our custom hand held fans becomes an indispensable item to carry outdoors as they provide the much desired breeze and even shade from the heat and glare. 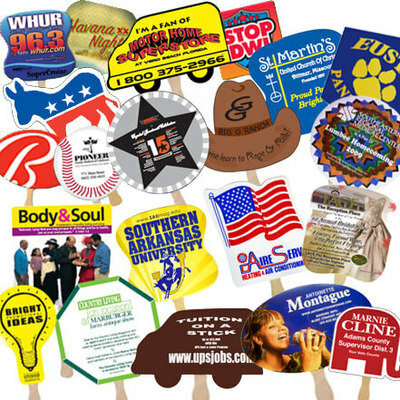 When temperatures soar to the 90s or even the 100s, Promotion Choice's beautiful and sturdy customized paper fans will give your customers the reprieve they need, and at the same time, advertise your brand, your text message, or your products/services in a very non-intrusive or non-invasive way. Our personalized hand fans come in so many different shapes and sizes – well over 30 different designs with new ones being added on a regular basis. Some of those shapes depicted in the illustration below are some of our more popular ones, which include square, bread slice, hour glass, house, number one, triangle, circle, oval, rectangle, rectangle (either vertical or horizontal orientation), cowboy hat, truck, octagon, telephone, elephant, helmet, donkey, guitar, tear drop, and many more! The shapes in the picture below which are shaded represent the most popular shapes, which also come in the sandwich style fans. Sandwich style fans feature two 16 point card stocks glued together so that the stick of the hand fan is nicely and neatly hidden and not exposed even on the second side. This give you the full two sides to fully design your logo, marketing message, or design on either side of the fans. With two 16 point card stocks stuck together, this also means you will get doubly sturdy personalized hand fans, with a combined card stock of 32 points, which will definitely not bend or buckle even in the strongest breezes. Single hand fans on the other hand will have the stick glued as opposed to staples (which are dangerous and ugly!) on the second side. This still gives you ample space for your design work on the second side, but it just means you have to work your artwork around the stick. Many of our customers don't mind this and design their artwork around the stick in cute and creative ways. When we print on personalized hand fans, we print on them with care, because our customers' success is our success. Cliche...we know, but we still take this motto very seriously, because we value happy clients and repeat business. A huge amount of our hand fan business is from repeat customers who have been so happy with the quality of our print jobs, our color matching ability, help with their artwork design, etc. Many come back to tell us how happy they are with our print quality and also the fact that our fans have a nice aqueous coating that gives each fan a nice semi-gloss sheen. Republican Party Vs Democratic Party! Custom paddle hand fans are popular also largely because they feature specialized shapes and a large imprint area for customer's message. Consider some of our very unique shapes like the breast cancer ribbon shape, or energy bulb, or barn, or truck, or donkey, or elephant shape fans. These could come in very pertinent as part of your logo or design concept. If you are campaigning for the Republican party for a political campaign for example, getting the elephant shaped hand fans would be perfect, as the elephant is the symbol for the Republican Party. Likewise, the donkey is the symbol for the Democrats, and a political message put in the right colors in the right shape will be that much more powerful in its delivery. See the two examples below of some past print jobs we have done using the Democratic Donkey and the Republican Elephant printed hand fan shapes. In our next article on hand fans, we will talk about some of our other imprinted hand fans with special pre-designed themes! These are awesome and should never be overlooked!